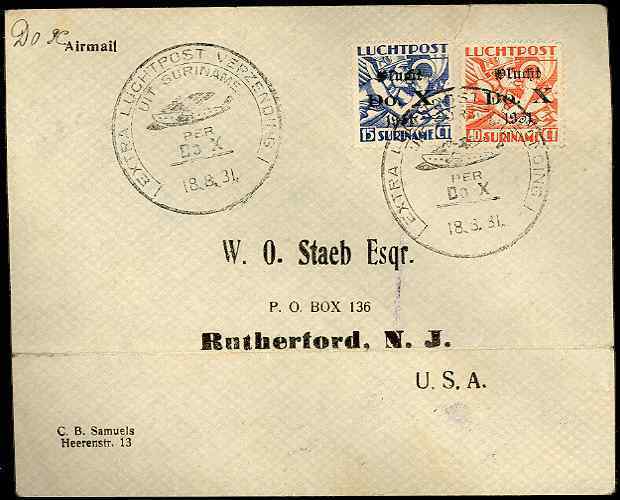 This airmail cover was flown on the Dornier Do-X on a segment of a Transatlantic journey. 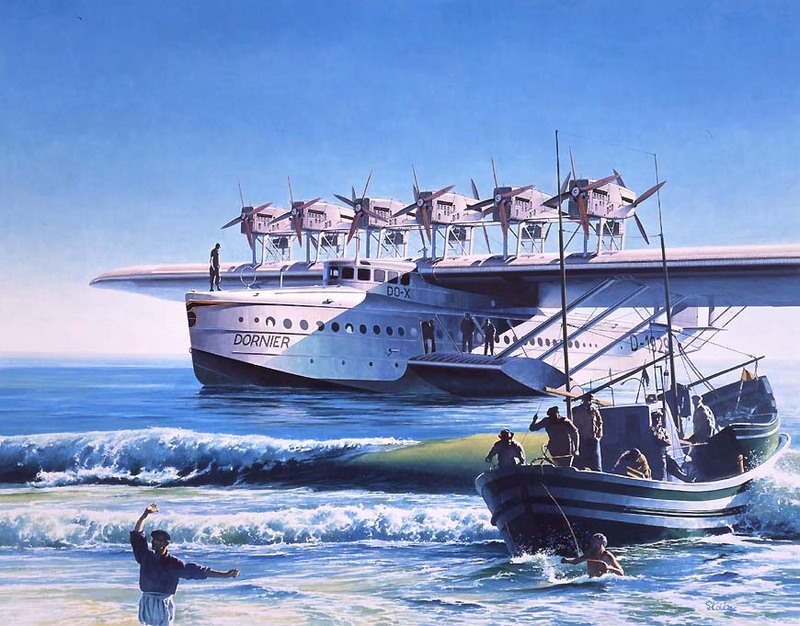 The Dornier Do-X was a 12 engine flying boat built in Germany. The Do-X was bound for New York City. This trip was an attempt to find a way to make the Do-X profitable. The owners ran out of money and the attempt failed. After its arrival in New York City it spent 8 months sitting in a drydock. The Do-X was finally flown back to Germany in May, 1932, on its last trans-Atlantic flight. 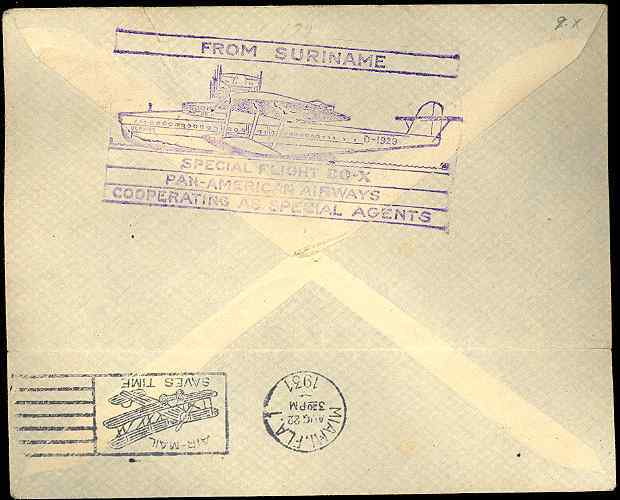 This cover received two special EXTRA LUCHTPOST VERZENDING UIT SURINAME PER Do-X CDS. The inscription is Dutch and translates to Extra Airmail Dispatch from Surinam per Do-X. Surinam is in the middle of the Guianas on the northeast coast of South America. British Guiana (now Guyana) is northwest along the coast and French Guiana is southeast along the coast. The preprinted airmail envelope was inscribed DOX. Pan-American Airways was cooperating as special agent. from Miami to Paramaribo, Surinam, since September 22, 1929. The first issue of Surinam airmail stamps, 1930 Allegory of Flight, was specially overprinted for this flight. This cover is franked with the 15c. ultramarine and the 40c orange (Scott C8 and C11). Both have a black overprint. a machine backstamp with an AIR-MAIL SAVES TIME and biplane killer. It probably proceeded to its destination in Rutherford, New Jersey, on an American airline. Rutherford is commuter town about 15 mi northwest of New York City.